This is the first in a series of commentaries that borrow heavily from the work of Rene Girard, a cultural anthropologist/theologian who argued that the Bible has provided profound, perhaps even unique, insights into human nature and God’s will. In particular, the Bible shows that, while human violence and destructiveness are universal, God’s love and forgiveness is infinite. Importantly, the Bible offers a way towards overcoming the human tendency to harm innocent victims, which is what God wants. Before continuing, I want to stress that these opinions are my own. 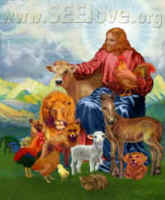 They do not reflect “official” positions of the Christian Vegetarian Association. I think they dovetail nicely with the CVA’s ministry to apply Christ’s love, compassion, and mercy toward all of God’s Creation, but one may disagree with my “Girardian” thinking and still embrace fully the CVA and its mission. Many people reject Christianity largely because they doubt the Bible’s stories of God’s intervention into human affairs and Jesus’ working miracles. They argue that these stories are unproven and have dubious documentation. Believing in Christianity, many argue, is no more reasonable than believing any other religion. Rene Girard similarly had little faith, until his studies revealed that Christianity has in fact offered insights that make Christianity distinctive, if not unique. Christianity, perhaps unlike any other religion, can explain a remarkable finding: Every known human culture either currently engages in sacred violence or has rituals that recall sacred violence. Why is sacred violence universal? Is all human violence, in a sense, sacred? Can Christianity, which has a sad history of victimizing innocent people, including persecution of the Jews, the Inquisition, brutal colonization of indigenous peoples in the name of God, and the massive witch burnings of the Middle Ages, show us a way to transcend the human tendency to engage in sacred violence? We will explore these questions over the next weeks.